It is time to think again about design’s social function and the way it is determined by our culture. 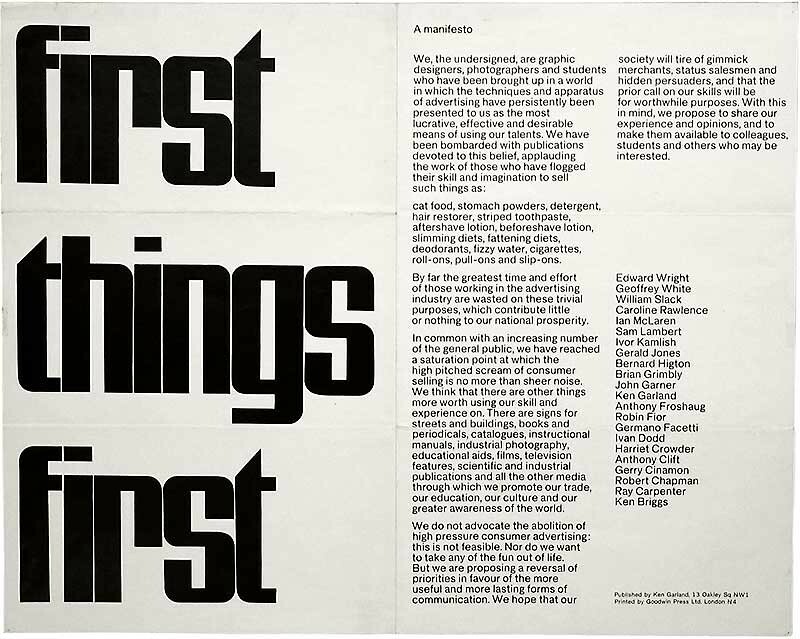 The ‘First Things First’ manifesto was first published as a folded broadsheet of 20 x 15 inches in January 1964. 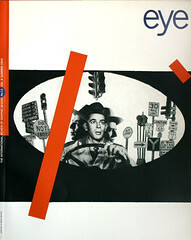 In 1964 British designer Ken Garland and a group of 21 colleagues issued a manifesto entitled ‘First Things First.’ Aimed at fellow graphic designers, it was a succinct and gutsy appeal to reject the ‘high pitched scream of consumer selling’ and omnipotent lure of the advertising industry in favour of what was defined as socially useful graphic design work. The manifesto was reproduced in the publication Modern Publicity, together with an interview in which Garland attempted to defend it to Douglas Haines (described as a creative executive with British agency and marketing specialists Mather and Crowther), who was hostile to the idea that there is anything wrong with the market place or that the advertising industry does anything other than a good and necessary job. What makes the manifesto interesting today is the realisation that its premises appear as radical now as they did 30 years ago. And more significantly, the issue it addresses is as unresolved now as it was then. But the manifesto also touches on a dimension that seems to be missing from current debate: a concern with the social function and purpose of graphic design. Discussion in the profession in the mid-1990s appears to have crystallized into a debate between two schools of thought. On the one hand there is the ‘new wave’ of Macintosh-devoted design, some of which has been produced under the theoretical auspices of poststructuralist analysis and is guided by an exploration of the formal problems of representation and meaning, as in the work of the Cranbrook Academy of Art. Some of its exponents claim that their output represents a new aesthetic; their critics dismiss it as a form of visual pyrotechnics, a lavish aesthetic feast but low on nutritional content. Such critics believe that despite its stated intentions (where there have been intentions to state), this work is aimless and impenetrable. On the other hand, a trend has emerged more recently that claims to seek a new clarity – of intention as well as aesthetic. Rick Poynor (Eye, no. 9 vol. 3) suggests that there is a growing reaction by ‘design students, teachers and young professionals’ against what are seen as the ‘excesses’ of formal experimentation and in favour of a less ambiguous, more message-related program. In the Netherlands, designers Dingeman Kuilman and Neils Meulman are calling for an approach that is not sophisticated, not technological, and not intellectual, just ‘basic’ (Emigre no. 25). 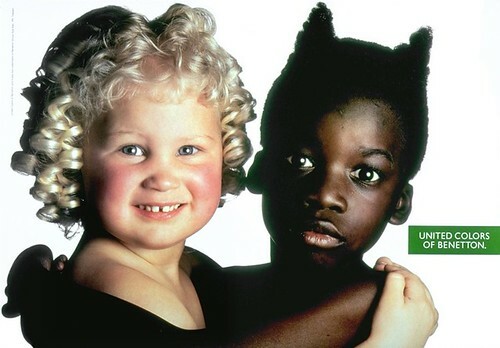 ‘The advertising industry corrupted society,’ said Benetton creative director Oliviero Toscani. His response has been a series of notorious campaigns about race, birth control, Bosnia and so on that are supposed to shock consumers out of complacency – and into what exactly? This invasion of our consciousness is in no sense a dialogue: the messages flow in one direction only, from manufacturer to consumer, and the purpose is still to make you buy jumpers. For some designers, and I would include myself and many of those I class as colleagues here, a search for formal solutions has only ever been a part of, not an alternative to, a longer-term socially and politically influenced project. For us (only an ‘us’ in as much as we have histories and influences in common), to interpret much of what is characterized as ‘new wave’ as playfully self-indulgent is not a refusal to ‘join in the party,’ nor does it signify lack of interest in new technologies and experimentation. Rather, it springs from a continuing interest that goes beyond a search for parts of the design jigsaw, of which formal visual vocabulary is a piece, to an understanding of how the jigsaw fits together. It is perhaps understandable that recent debate has centred on conflicting ideas about what contemporary design should look like and what methods it should employ in order to create understanding: how it should function formally. The impact of computer technology has transformed the nature of the design activity, allowing designers to assume control (competently or not) of many stages in the production process that were traditionally shared among a number of people with different skills and expertise. It has also had a profound effect on aesthetics. The computer makes it possible to construct multifaceted compositions with relative ease and at vastly increased speeds. Its capacity for sampling, duplication and the integrated assembly of all manner of visual elements has given designers the opportunity to view countless variations and to realise more visually complex ideas. Visual, formal possibilities have taken centre stage. Discussion of content, apart from as formal exploration, has tended to concentrate on the internal subject matter of individual works. But there is another sort of content in graphic design: its social content as a form of social production. The significance of this lies in the ways in which function influences form and purpose informs content. It suggests that the character of our work is determined by more than our intentions alone, since production processes and the social context within which the work is received have a profound impact in directing, respectively, its aesthetic and the kinds of understanding it is capable of generating. These issues touch on the very definition of graphic design. To see graphic design as a form of social production rather than as individual acts of creativity means recognising that it is subject to the same economic and ideological forces that shape other forms of human social activity. It means that in order to understand the nature of our activity and to think about its possibilities, we must be able to locate it within a historical context that relates it to economic and political forces. This is (strangely) problematic, as Anne Burdick rightly states (Eye no. 9 vol. 3), because ‘it is considered outside our role to analyse the content of our work in relation to politics, theory, economics, morals and so on.’ But if the present debate is about creating a body of work that is meaningful to people in general, that plays a part in the development of a stimulating visual culture, then it must involve understanding how our culture functions, how it is shaped, and how it shapes our perceptions of ourselves. It means addressing people’s need for a culture in which they can participate actively, for which they can help shape the agenda. It will inevitably involve an analysis of what prevents us from building such a culture. The economic organisation of our society depends on the promise of ever-expanding production and the building of markets to absorb that production. We have the means to make goods in sufficient quantity and range to satisfy all our basic needs. But, ‘Goods are no longer sold on the basis that they satisfy a known and voiced human need, but instead demands are developed through ‘research’ and through marketing in order that commodities may be produced to meet them,’ explains Owen Kelly (Community, Art and the State: Storming the Citadels, 1984). Goods are only a means to an end: the production of surplus value. Consequently, ‘there can be no such thing as sufficient production of any commodity, since there is no such thing as sufficient surplus value’. This fragmentation of our needs and desires does not operate only in relation to areas of industrialised production. It is paralleled in the operations of the state, from health and medicine to education and leisure, where we are taught to consume professionalised services. In this sense there are no areas of our personal lives that are not subject to the social pressures of the marketplace, wherein decisions that might have been made by consenting citizens are reduced to purchasing choices made by passive consumers. Since the 1950s and 1960s, writers have referred to these encroachments as inducing a state of crisis in personal and cultural life. In addition, the political avenues through which we might expect to control the decisions that govern our lives are severely restricted. Stuart Hall has talked about ‘a growing gap between where people are politically and the institutions and organisations which express that in a formal political way.’ Recent trends reveal a growth in intense pseudo-religious movements, in nationalist and neo-fascist ideas, in young people embracing directly oppositional lifestyles. Few would deny that at the centre of this is a search for something meaningful to believe in, a vision of ourselves as empowered human beings able to act upon our needs and desires as we define them. It is crucial that we recognise that there is a direct correspondence between the condition of our culture and the ways we organise the production of materials. The form of economic organisation we refer to as capitalism ceased long ago to be simply that, and has become a means of organising the consciousness necessary for that economic system to flourish. As designers whose work is concerned with the expression and exchange of ideas and information and the construction of the visual vocabulary of day-to-day culture, we must establish a perspective on where we fit into this scheme. We must ask in what ways our function helps to organise consciousness. We must also discover to what extent and in what ways the solutions, vocabularies, and dialogues that we are able to conceive and construct are determined for us. The ‘First Things First’ manifesto was an attempt at least to address these issues. Its conclusions, however, fall short of what seems necessary. Written at a time when the high-intensity market was establishing itself at the heart of the design profession in Britain, it was perhaps a last-ditch attempt to hold back the flood of ‘gimmick merchants, status salesmen, and hidden persuaders’. It starts off in a forcible and radical manner. But at the beginning of the fourth paragraph it extinguishes its own flames when it says, ‘We don’t advocate the abolition of high pressure consumer advertising: this is not feasible’ – without making clear whether or not this is perceived as desirable. After its declaration of a rebellion against the techniques and apparatus of high-pressure consumer advertising, there is a trace of retreat here, despite the fact that it would probably be defended as ‘realism’. Garland echoes this concession in the interview, and the power of his argument is all the less compelling for it. Early on he concurs with Haines that ‘We are not against advertising as a whole. The techniques of publicity and selling are vital to Western society.’ But isn’t that the problem? This allows Haines’s contention that high-pressure advertising and the ideology of the market place are healthy and natural to go unchallenged, and leaves an impression that what Garland is arguing for is the same cake, sliced differently. But the logic of the manifesto implies that social and cultural needs are constantly circumvented, if not distorted, by the power of an industry whose primary purpose is to create demand for consumption, regardless of usefulness. Furthermore, that the effect – on young designers in particular – of the absence of an alternative sense of what meaningful work might be is leading to a gradual erosion of enthusiasm and creativity. What is needed is a different cake altogether, but to argue for such a thing is to take a leap into the unknown. The modern advertising industry is the creation of the high-intensity market, and graphic design has always been at the centre of its strategy. Its history forms a large part of the history of design. To question that industry and the ideology of consumerism it promotes is to question our whole economic organization. It is easier to argue for more of the cake. The manifesto’s concern with purpose and social function should not be confused with a moralising preoccupation with ‘politically correct’ subject matter. It should not be interpreted as a determinist concern with ‘the message,’ though it does not exclude a commitment to direct (or indirect) political expression. 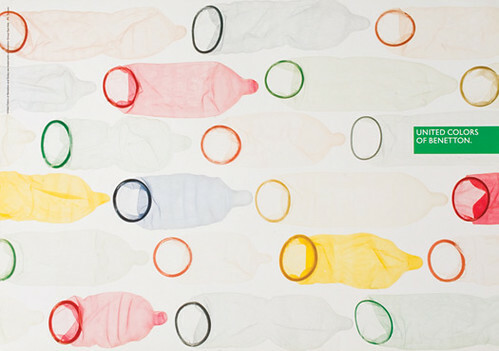 Devotees of the new wave may well demonstrate little interest in the ‘message as content’ approach, perhaps justifiably, when one considers the unbelievably inane work of ‘cultural ground-breakers’ such as Oliviero Toscani and his sponsors, Benetton. ‘I want to make people think,’ says Toscani in an interview in the Independent (16 December 1992). ‘I want them to remember a name.’ Thus social criticism is appropriated in the struggle for brand identification. ‘It [the advertising industry] persuades people that they are respected for what they consume, that they are only worth what they possess,’ says Toscani, angrily upbraiding the industry for corrupting society. Most advertising, he tells us, is based on the emotions and has nothing to do with the product. One can only wonder what graveyard crosses during the Gulf War, a ship overflowing with refugees, an electric chair, children in Third World slums, and a nun and priest kissing have to do with expensive, multicoloured knitwear? But even these are surpassed by Toscani’s idea for a ‘fun’ campaign about wife-beating for Guinness. What makes Toscani’s ever-so-radical ideas ever so depressing is that his accurate critique of the advertising industry’s effect on our aspirations and self-image appears to be of no help to him in establishing the link between the industry and the economic ideology that spawned it. Whatever his intentions, Toscani’s posters are merely a state-of-the-art marketing device masquerading as social conscience. It is extreme arrogance to throw images at people in the belief that they need to be told what issues are of social importance. Radical work is never a question of presenting correct political opinions, but is concerned instead with the nature of the dialogue that is made possible between the author and the audience. It is not at all clear, on the other hand, in what sense the approach advocated by Dutch designers Kuilman and Meulman is basic, or what is the meaning and significance of what they have to say. Is this perhaps a private argument between them and the technological, intellectual sophisticates about the most effective formal approach to sell spicy sausage or decorative floor tiles? Or is the liberation from confusion they wish to achieve to be reserved for greater purposes? Appending political messages to work as if forms were empty vessels is simple-minded, and advocacy of ‘basicness’ is meaningless if it is concerned only with the internal logic of design. But does this mean that formal exploration, as content, is the way forward? Writers such as Roland Barthes are said to have been of seminal influence in the development of the work and ideas of at least one agency of the new wave – the Cranbrook Academy of Art. Jeffery Keedy, a former Cranbrook student, says, ‘It was the poetic aspect of Roland Barthes which attracted me, not the Marxist analysis. After all, we’re designers working in a consumer society, and while social criticism is an interesting idea, I wouldn’t want to put it into practice’ (Eye no. 3 vol. 1). Barthes’s work is indeed poetic, which gives it a resonance lacking in much Marxist theory, but to disconnect the critique from the form seems a perverse example of literary raiding. The work of other French writers of the same period, such as the Situationist Raoul Vaneigem, is also poetic and also concerned with the decay of personal and cultural life under modern capitalism. His book The Revolution of Everyday Life deals with the subjugation of our potential to be active, independent-minded and creative. It is a complex description of our condition, which focuses on the corruption of our desires, dreams, values, and aspirations, and a ferocious social critique. If it is not on the Cranbrook reading list, perhaps it should be. The major artistic movements of this century – the Futurists, Constructivists, Dadaists, Surrealists – all had a theory of society which guided their explorations. The exploration of the formal structure of language – its signs, symbols and how these construct and carry meaning – should be the staple diet of designers. Language is a means through which we express our consciousness of ourselves and our relationship to the world; it is our attempts to describe our situation and to think about the future that lead us to search for appropriate vocabularies. Language changes when it is no longer able to express what its users require of it, so unless it is to be of academic interest only, an exploration of language must also take into account the changing consciousness of human beings. It is difficult to comprehend the point of exploring form if it is not related to contemporary problems of vocabulary and the search for meaning. The study of visual form and language is limited if it does not consider the forces of cultural production, which involve a set of social relations between producer and audience. Whether our activity and its products are open and empowering, whether they contribute to the building of a democratic culture, is not dependent only on the content of our work, but also on the productive social relations that affect the nature of the dialogues we are able to construct. A large advertising poster for multicoloured knitwear, for instance, is not a dialogue on equal terms, if it is a dialogue at all. It is designed to make an intervention into our consciousness in ways we cannot ignore; it shouts at us so that we may remember a name that will influence our acts of purchasing. It is a form developed for a social context that the audience cannot control. This is what makes it oppressive. No amount of fiddling with the visual forms it employs or the message it carries will transform it into an open-ended product. But the ideology of consumerism is not limited to the world of commerce. Our consciousness is fragmented so that we are better able to consume everything: films, music, fashion, diets, healthcare, education, information, even our own history. This problem cannot be avoided simply by choosing between ‘good’ or ‘bad’ products, or between commercial and non-commercial work, since the nature of the problem is not just consumption but the ordering of our consciousness to become consumers in the first place. Graphic design has a part to play in creating a visual culture that empowers and enlightens, that makes ideas and information accessible and memorable. Many designers may argue that their job is not politics, and they would be right. But this does not prevent us from developing ideas about cultural democracy. We cannot separate our work from the social context in which it is received and from the purpose it serves. If we care about the integrity of our design decisions, we should be concerned that the relations implicit in our communications extend active participation in our culture. If what we are looking for is meaning and significance, then the first step is to ask, who controls the work and whose ends does it serve? The computer revolution that brought us new aesthetic possibilities has given us other opportunities too. The technological condensing of the production process has the potential to alter our notion of authorship, and with it our aspirations. The technical self-sufficiency the computer has allowed may give us the conceptual space to develop a more complete consideration of our work in relation to the way it is received and the purpose it serves. It may encourage us to initiate more often, and in the process to establish partnerships and collaborations in which design is not simply a means to sell and persuade, but a means of organising ideas and finding forms of expression that suit the interests of a more specific audience. The work that flows from such a practice cannot be prescribed. It may or may not be sophisticated, technological and so on. It will in no way preclude an exploration of the formal representation of language. Its content may be concerned with what it is we are able to think about (subjects), or the ways in which we are able to think (forms). It will recognise that how something is produced and distributed socially carries with it specific relations that affect the dialogue that is possible between author and audience and limit the sort of meanings that can be constructed. Above all, it will acknowledge the link between our choices as designers and the sort of culture we wish to contribute to.